It is an earring (earring) in which a small flower and glass beads of about 6 mm in diameter are tightly packed into an oval part. There is a small leaf attached to the end of the chain. It is an earring (earring) in which a small flower and glass beads of about 6 mm in diameter are tightly packed into an oval part. There is a small leaf attached to the end of the chain. It is a different asymmetry design on the left and right. 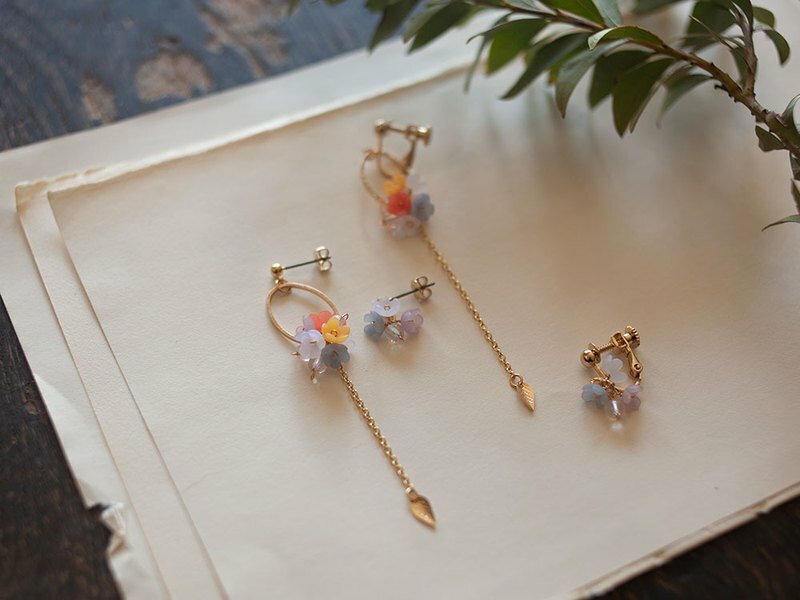 ------------------- Earrings (screw spring type) Pierce (allergy-response: titanium post) ------------------- Length: 8 cm ※ Each item is made by hand. There may be distortion, uneven color, and small fibers. Please consider on understanding that it is a handmade item. [Gift wrapping] (200 yen) It becomes a box + ribbon.